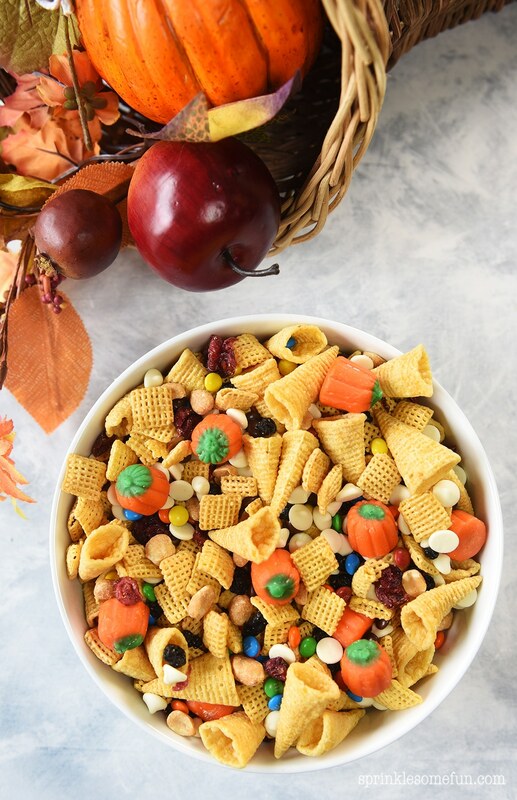 This Fall Snack Mix for Thanksgiving is a sponsored post. All opinions are my own. It’s that time of the year when the leaves have changed their colors and everyone is making plans to get together. One of my favorite holidays is coming up which is Thanksgiving. I love getting together with my family and friends for a big ole Thanksgiving meal. 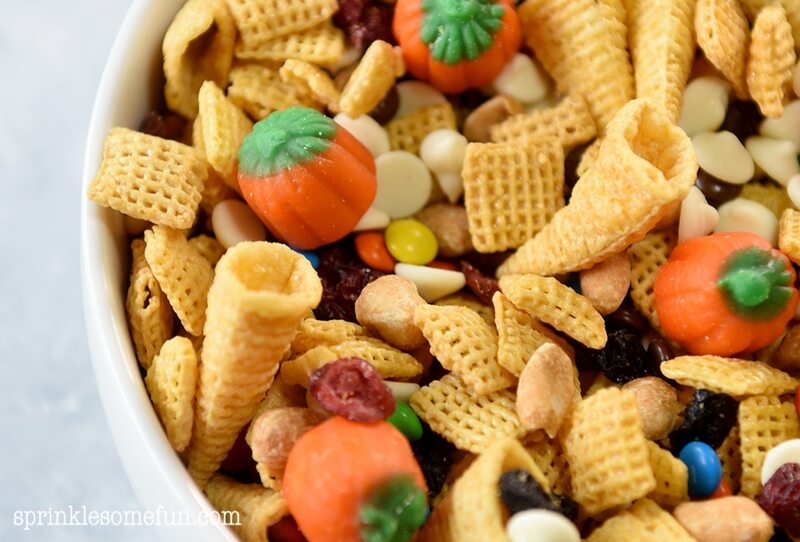 One thing we like to snack on every year is this Thanksgiving Fall Snack Mix. I love how this snack mix uses Bugles corn chips to look like little cornucopias! The Mellowcreme pumpkins just make the whole mix over-the-top cute. 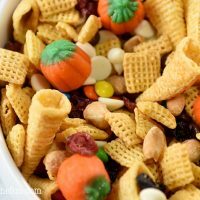 My kids love to help out with making this Thanksgiving Fall Snack Mix and every year we change up the ingredients a little bit. We love the salty sweet taste of this snack mix and it’s great to enjoy all season long. Use seasonal items. Either you love candy & candy pumpkins or you don’t! Add in other Fall favorites like chocolate candies or fall themed candies. Add your favorite cereals. Love chocolate cereal or maybe Honey Combs? Add those in instead of the Chex if you want. Any cereal will work with this mix. Need a Gluten Free option? Many gluten free options will work for this mix. In fact… most of the items we used are gluten free! The only thing that is not specifically gluten free are the Bugles. They have a warning that they may contain wheat. If you want to substitute the Bugles you can use gluten free pretzels instead. Make extras and gift it up. This snack mix is great for any age range. It’s so cute when placed in a Mason Jar with a little note on the side. Make it for friends & family or for your co-workers. The other great thing about this snack mix is it can double as a cute table display. We like to store ours in a glass jar that has a lid and we place it out in the middle of the table. I love how it looks with all the pretty colors and it makes my table look ready for fall. Make enough to place in a tall jar or serve it up in a candy bowl. A Thanksgiving or Fall themed bowl would be cute too. 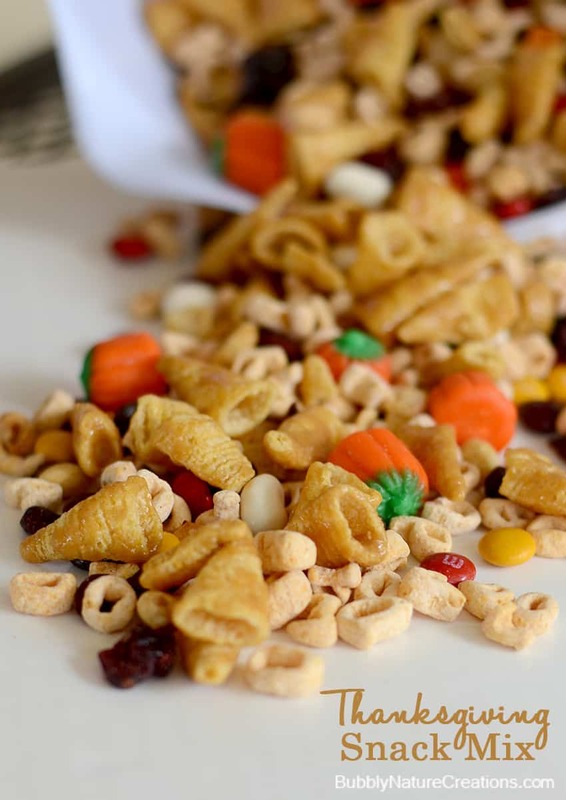 We like to eat this Fall Snack Mix on the day before Thanksgiving as we are prepping for the holiday too. It’s not too messy and by serving it out of the bowl there is little to clean up. Perfect for when the kids want to get into all the yummy Thanksgiving treats that are meant to be for the next day. Just let them have a handful of this snack mix instead! 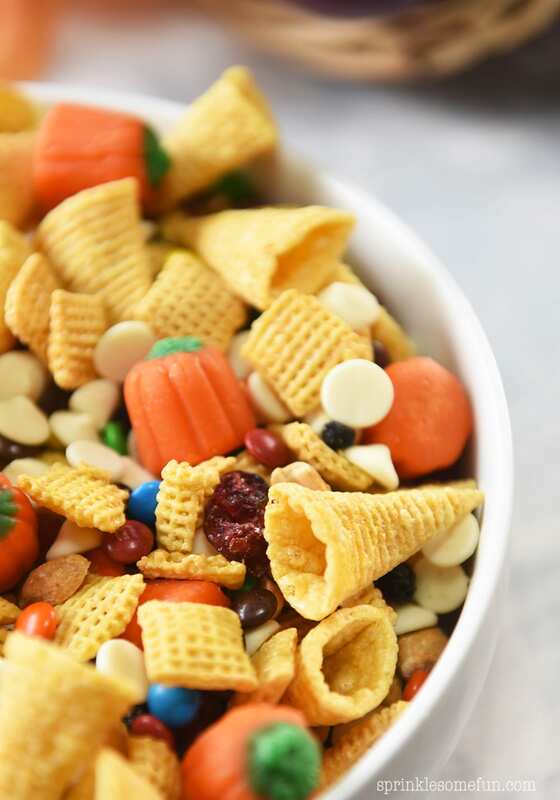 This snack mix is also a great use for all the leftover Halloween candy you might have around. Just use any small candies that you think would taste great with the snack mix. You can also use the snack mix in other ways than just eating it. 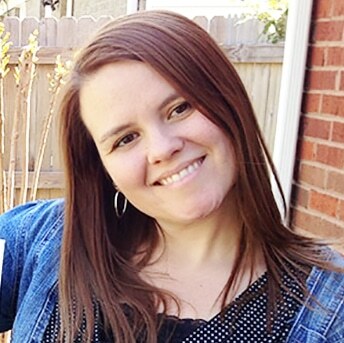 I am always looking for fun ways to incorporate learning and playing together. Kids learn best when they are having fun! 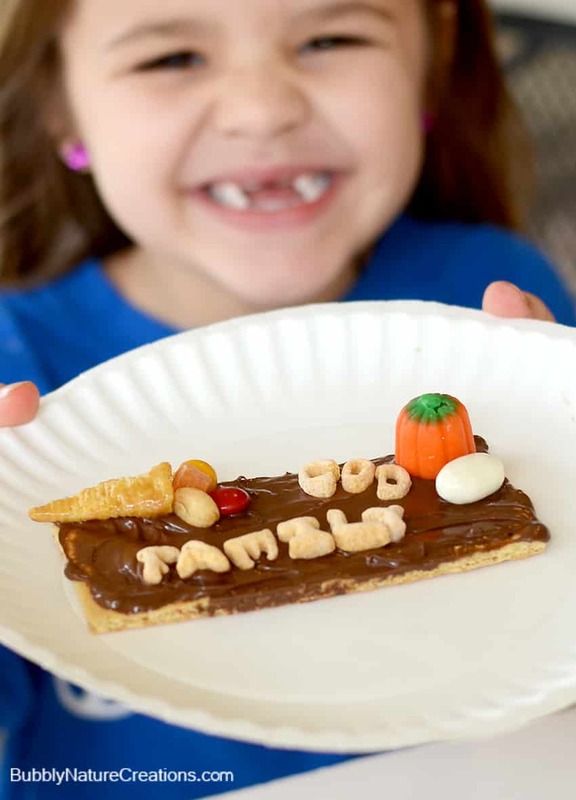 I came up with this fun way to use the Thanksgiving Fall Snack idea and use Alphabits cereal in it so they can spell out what they are thankful for. We took graham crackers, chocolate hazelnut spread and wrote out the words they were thankful for with the Alphabits cereal! My first grader, who is learning how to spell, had a great time learning and playing with her food. My little one was so proud of her spelling lesson. She is very thankful for God and Family… so sweet! 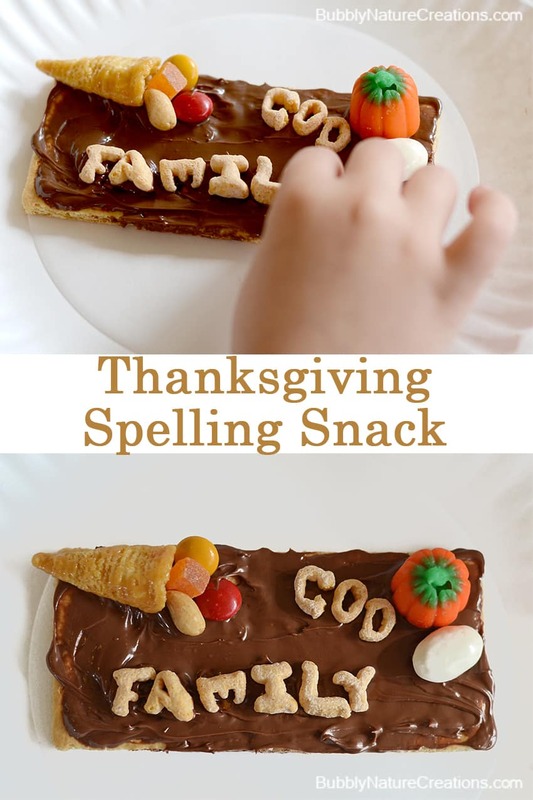 So easy and the snack spelling lesson turned out so cute! Use age appropriate ingredients. There are snack items that I use for my older kids like popcorn that I wouldn’t use for my toddler. Instead of dried fruit find freeze dried fruit or yogurt bites which are easier to chew for toddlers and some preschoolers. Let the the kids choose some of the ingredients. Nothing is more fun for a kid than to get to pick out your own groceries at the store. Have the kids pack the Ziploc bags. If you are storing these into portion sizes you can have your kids help bag them. It’s a chore for me, but my kids love to do it! Of course really young kids may not be able to do this yet, but elementary age kids will probably be able to handle the task. Is your little one learning how to count? Make it a math lesson by asking them to separate all the items individually. Have them count how many of each item they have. So for example if they might have 3 pumpkins, 2 cornucopias and 5 chocolate chips. My kids love math lessons like this! 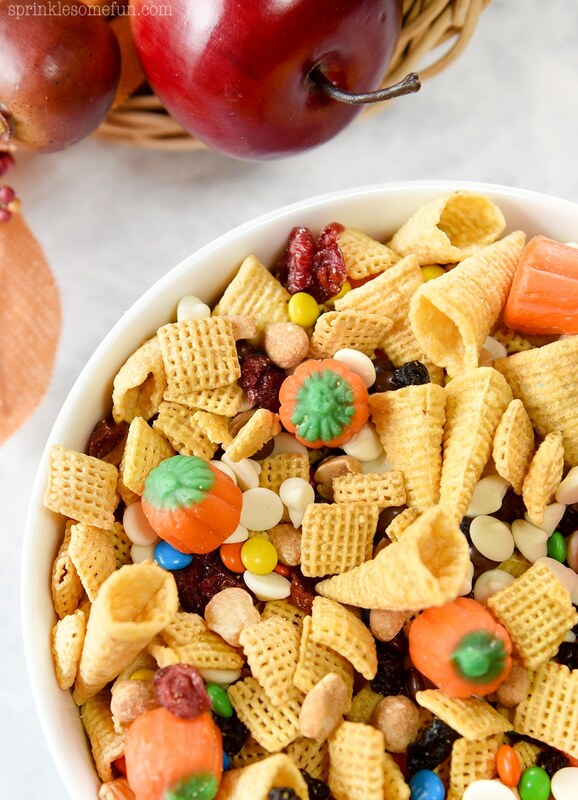 What ideas do you have for making a fun Fall Themed Snack Mix? Do you like to involve your kids on making things in the kitchen too? Let me know in the comments below. Add everything to a large mixing bowl and toss it all together. Serve out of the mixing bowl or separate into individual portions. Store in an air tight container for up to 2 weeks. You can also place these in individual portion bags. Enjoy!